Drip irrigation applied to sugarcane cultivation, a solution adopted by NaanDanJain with Braskem’s support, offers an increase of at least 65% in sugarcane yields compared to the traditional rainfed method. In some cases, the improvement in yield can reach 200%. “The plastic-based solution is highly aligned with the objectives of farmers, who seek to produce more using less. The drip irrigation system is a great example, since it boosts yields while minimizing the consumption of fertilizers and water per ton produced,” said Ana Paiva, Market Development specialist at Braskem. For irrigating sugarcane, the most common practice is to use tubes installed at a depth of 30 centimeters and as close as possible to the plant’s root system, which enables precise delivery of water and nutrients. A practical example is the Jalles Machado Mill in Goiás state, which registered a 65% increase in yield in the first year of irrigation compared to the yield obtained from an area using supplementary irrigation (the method traditionally used in Brazil, in which sugarcane receives only a portion of the water needed to reach its maximum yield). The expectation for the project at Jalles Machado, which has 400 hectares irrigated using a drip system, is that in 2019 the yield of the irrigated area will be up to 100% higher than that of the area with supplementary irrigation. Leandro Lance, Market Development and Innovation manager at NaanDanJain Brasil, notes that “on fields with full irrigation systems (which fully compensate the lack of rainfall), the sugarcane develops more and the higher yield reduces the cost per ton produced, since the higher yield dilutes the main costs of production, which are leasing and planting, while reducing freight costs when the irrigation system is used near the mill. The practice also minimizes the risks of production shortfalls and variations in sugarcane yield, which in turn reduces idle capacity at mills,” said the executive, explaining that some producers recouped their investment in around two and a half years. An Israeli-Indian company, NaanDanJain directly supervises (with a full-time engineer during the project’s first year of operation) some of Brazil’s most productive irrigation projects. With the expertise acquired on approximately 400,000 hectares of sugarcane fields with drip systems around the world (mainly in India), as well as intense cooperation with Brazil’s best technicians in the sugar and ethanol industry, NaanDanJain promises to make a significant contribution to expanding this system on Brazilian sugarcane plantations. “In sugarcane drip projects, we do not obtain yields of less than 150 tons per hectare in India and often attain yields of over 250 tons per hectare. This year, one producer even achieved a yield of 400 tons per hectare. 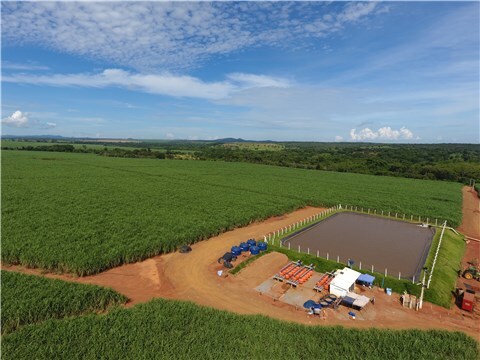 In Brazil, we already are seeing yields of 207 tons of sugarcane per hectare and of 30 tons of sugar per hectare on the fourth cut, such as at the Boa Vista Mill of the SÃO MARTINHO group in Quirinópolis, Goiás, which shows that we can seek average yields of around 180 tons per hectare and longevity of around 10 years.